Goaltending plays an integral part in the Stanley Cup Playoffs so NHL.com broke down the Stanley Cup Final battle between Corey Crawford of the Chicago Blackhawks and Ben Bishop of the Tampa Bay Lightning. After starting with Crawford, it’s Bishop's turn in the spotlight. Much like many goaltending coaches do before a playoff series, NHL.com correspondent Kevin Woodley, the managing editor of InGoal Magazine, charted every goal scored with the help of a program from Double Blue Sport Analytics. Regular-season goals were recorded in their original Save Review System, and playoff goals, including how they were scored, were tracked in the soon-to-launch SRS 2.0. The graphics showing where goals went in and shots were taken from on the ice are nice, but the real value is analyzing the plays that led to them and whether they reveal strengths, weaknesses and tendencies that can be targeted. Bishop has put himself in the history books during this playoff run by becoming the first goalie to backstop his team to the Cup Final with a road shutout in Game 7 of the conference finals, which Bishop did in Game 7 of the Eastern Conference Final against the New York Rangers. He also is the first goaltender with road shutouts in Games 5 and 7 of the same playoff series, and the first to win his first two Game 7 starts, a run that started in the Eastern Conference First Round against the Detroit Red Wings. But Bishop's first playoff experience hasn't all been positive, which is fitting because there are ups and downs that come with being a 6-foot-7 goaltender in the NHL. The upside is obvious: Bishop fills a lot of space, with his shoulders covering most shots even in the butterfly. The downside is today's NHL game is fast, with a lot of movement that forces goalies to move east/west. So the bigger a goalie is, the more holes typically open when he has to move. It's also tougher to stop a frame as big as Bishop's once it gets moving in one direction with speed, which makes for a delicate balance because Bishop is not passive by any means, playing outside the edges of his crease at times and trusting that his reach can make up that extra distance. There has been evidence of the positives and negatives during the playoffs. And as much as Bishop enters the Final with a road shutout streak of 145 minutes, 43 seconds, the Lightning did a great job against the Rangers of limiting the kinds of scoring chances that can exploit the negatives. Whether they can keep it up against the Blackhawks will play a role in Bishop's chances of ending his postseason on another positive note. When he's on -- Bishop is best when his movements are controlled, staying over his knees and shifting into plays and shots, rotating into lateral plays and keeping his big frame squared up on shooters, just as he did to rob the Rangers' Ryan McDonagh midway through Game 7, stopping and controlling one of the Rangers best scoring chances. When he's off -- Bishop drops and reaches with his glove and legs rather than shifting or pushing his body into the puck, opening holes and twisting his torso away from shots. That leaves him stranded when his aggressive positioning creates extra recovery distance his long limbs can't make up for. The 29 regular-season goals he allowed high on the glove side isn't surprising for any goaltender playing today's style. But the biggest surprise may be the 23 that went in along the ice on the glove side. That total plays a big role in a somewhat alarming discrepancy between the two sides: Ignoring goals allowed between his legs, Bishop allowed 75 goals on his left compared to 47 on his right, or blocker side, during the regular season. That has balanced out so far in the playoffs, with 20 allowed in to his right and 16 to his left. But the bigger trend is hard to ignore. Circumstances behind each goal vary but often involved Bishop either getting caught at or beyond his posts on his blocker side or a poor tracking habit on his glove side that locks up and limits his recovery movement back to the left while also explaining some of the goals allowed high over his glove. Among the emerging trends during the playoffs has been the number of rebound goals Bishop has let in. The total isn't alarming, with 10 of his 42 postseason goals-against scored on a rebound, but eight of those came against the Rangers in the conference final. They weren't all were on Bishop; some came off deflections he was lucky to stop in the first place. But there also were second chances after shots into Bishop's body that he tracks and controls better when playing well. Make him move: This is true of all goalies. Plays that force lateral movement, especially a complete turn by moving the puck across the middle of the zone below the top of the faceoff circles, an imaginary line former NHL goalie and MSG Network analyst Steve Valiquette has dubbed the Royal Road, lead to a better shooting percentage. But it appears to be even more important against Bishop. In the regular season 62 percent of Bishop's goals-against involved a lateral movement and 30 percent of those were across the Royal Road. In the first round against the Red Wings eight of the 13 goals involved lateral movement, including six across the Royal Road. The Montreal Canadiens did a poor job of creating chances across the Royal Road in the second round, but five of their 10 goals involved forcing some type of lateral adjustment by Bishop. The Rangers scored 10 goals that included some type of lateral play, including seven across the Royal Road, but like the Canadiens failed to create lateral attacks while being shut out in Games 5 and 7. The Rangers' best chances came in straight lines or off lateral passes above the faceoff circles, which allowed Bishop, who is a good skater for his size, to square up early and present his big frame aggressively atop his crease. 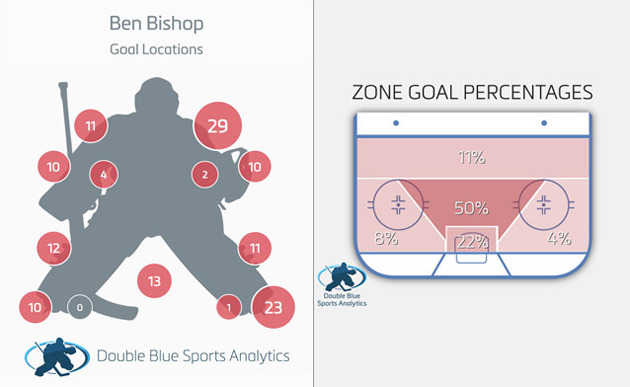 Backdoor tap-ins: A lot of those 23 regular-season goals allowed along the ice to Bishop's left were tap-ins explained by a combination of poor coverage and Bishop getting stranded on the other side. But his tendency to reach rather than shift into shots appears to be stronger on the glove side as well, including the occasional use of old-school half-butterfly glove saves, which inherently delay a proper recovery to his left. As long as Bishop's legs are, once he's got them fully extended in this manner there's nothing left to help push him further left, meaning shooters with enough time and patience often are left with either a gap inside the post or, at worst, needing to lift the puck over the outstretched pad. Stretching Bishop laterally on 1-on-1 situations in tight also can leave him reaching early. Get it up anyway: Even when Bishop is forced to reach and stretch he never is out of a play, in part because of a willingness to abandon technique and just battle and in part because of his incredibly long legs. The Rangers found this out the hard way several times, including a right-pad robbery on Martin St. Louis midway through the third period of Game 4 of the conference final, and a similarly desperate left-pad save on Jesper Fast early in the third period of Game 2. Fast appeared to have the entire net on a rebound of Rick Nash's shorthanded rush chance but couldn't get the puck over Bishop's outstretched leg on a play that would have tied the game. Instead the Lightning increased the lead before the power play expired. It was the perfect illustration of how Bishop's size, even stretched along the ice, means he never is out of a play, and how shooters not bearing down on those chances gives him a chance to make a momentum-changing save. High glove, left pad: That low glove-side space also is a function of a poor tracking habit that played a role in the high-glove exposure. When he's not on top of his game Bishop tends to pull off glove-side shots with his head, which then opens his left hip and shoulder. When he does, it not only fails to take advantage of his big frame and leaves him overly reliant on hand-eye co-ordination, but also limits his left-pad extension, sometimes pulling it out of the way as he initiates recovery movements to his left from his knees. Under and through: Bishop recovers up to his skates on plays where a lot of goalies would stay down and move from their knees. It fuels his ability to get out to more aggressive save positions at the top of his crease on rebounds and after scrambles. But there are times it also opens space low along the ice. That included the Rangers' opening goal in Game 6, with Derick Brassard able to open Bishop alone in tight in large part because Bishop got back to his skates, and got up off the wrong skate, rather than maintain a good ice seal with a butterfly push from his knees. Keep it away: For all the focus on how to score on him, it's important to recognize how many chances Bishop eliminates with his confident, aggressive puckhandling, which can stifle any forecheck that isn't smart about keeping dump-ins away from him. If the offense Bishop's puckhandling prevents isn't obvious, the offense it creates is: He has three assists during the playoffs from jump-starting Tampa Bay's transition game. Premature Post Play: Bishop typically uses reverse-VH technique on sharp-angle plays near or below the goal line, dropping the short-side skate and pad on the ice and sealing the post by leaning his upper body into it. There are times he has been criticized during the playoffs for going down too soon on these plays, but it's actually part of how he always plays. As for his tendency to use reverse-VH earlier than needed, it hasn't cost him, in part because he covers most of the short side right up to the cross bar even though his long legs means having to lean further back over them to seal the post. That can leave gaps over the pad that cost Bishop goals during the regular season, and that big lean back into the post to try and close those holes also can delay slightly his ability to get off the post, especially on the blocker side, creating backdoor openings.